The proposal to increase the allowance of Members of the Colombo Municipal Council (CMC) by Rs.20,000 was passed at the sessions held on August 24, said one report. The proposal had been presented by Mayoress Rosy Senanayaka, and accordingly, the monthly allowance of a Member of CMC that was Rs.34,000, would increase to Rs.54,000. The controversy over the order placed by the Western Provincial Council to purchase 125 luxury chairs for the council chambers at the newly-built building complex of the council in Battaramulla has not been sorted out yet. According to reports, the chairs which are to be imported (from Belgium according to the JVP but from Spain according to Western Province Chief Minister Isura Devapriya) have been priced at Rs. 640,000 and that would cost the council a massive Rs. 67.5 million. The purchase was temporarily suspended by Western Province Governor Hemakumara Nanayakkara at the request of JVP councillor Lakshman Nipunaarachchci. One step above, at Parliament level, there was a move in July to increase the salaries of ministers, deputy ministers, state ministers and all parliamentarians by approximately 215% to be on par with the recent salary increase given to Judges. According to the reports, the salary increment was to be effective from January this year and that it was to be paid in August with the arrears. 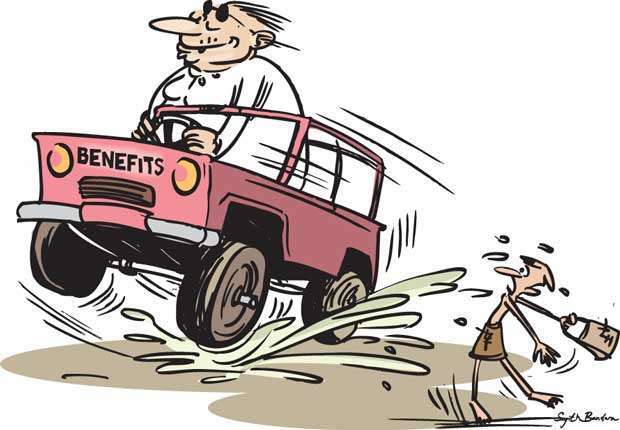 Accordingly, the salary of an MP would increase from Rs.54,285 to Rs.120,000 while the salary of a deputy minister goes up from Rs.63,500 to 135,000 while the salary of a minister and a state minister would be increased from Rs.65,000 to Rs.140, 000. However, the move was postponed at the instance of President Maithripala Sirisena. Another move to pay a monthly allowance of Rs. 200,000 for monitoring MPs has also been suspended by the President. Meanwhile, in an interesting turn of events, the Commission to Investigate Allegations of Bribery or Corruption (CIABOC) has cleared the way for lawmakers to sell super luxury vehicles imported under special duty-free scheme available for parliamentarians since the 1970s. Secretary to the CIABOC R.M.V. Shanthi Jayasekera has asserted that the transfer of vehicles imported by lawmakers wasn’t contrary to the Bribery and Corruption law. Jayasekera was responding to Attorney-at-law and public litigation activist Nagananda Kodituwakku, who, soon after the present government assumed office in 2015, moved the Supreme Court against the CIABOC for not initiating action against those who sold their vehicles. The politicians say that they need luxury vehicles at concessionary price as they have to toil day and night working for the people, but once they get the vehicles they are being sold. Now it is not illegal either. The figures in these stories do not in any way reflect the correct amounts involved in maintaining these people’s representatives, as another recent report had said, for instance, that the government spends Rs.7.5 million a month to maintain a Cabinet Minister. One does not need to go deep into these reports as they clearly reflect the attitude of the so-called people’s representatives towards taxpayers’ money. Only the fact that more than 3000 schools in the country do not have toilet and drinking water facilities suffice to gauge their concern about the people who vote them into power.